Ubuntu Contributionism is the title of a book written by Michael Tellinger. 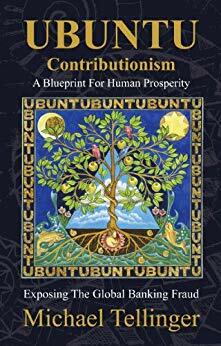 In this book, Michael Tellinger proposes that Ubuntu Contributionism is a blueprint for human prosperity. In the first part of the book, Michael Tellinger exposes the global banking fraud. He points out that our current system is broken and that we are in need of a new system, not attempts to repair a system with fundamental flaws. The new system will be a reflection of our new reality. We can transition to the new system without any violence, opposition or conflict. You can download the Ubuntu Contributionism PDF here. Click here to open the Ubuntu Contributionism PDF in a new window. To save the PDF, right-click Ubuntu Contributionism PDF and select “Save link as”. Michael Tellinger recounts the origins of money, and its design as a tool of control. He describes the history of economic slavery. He then proposes that our freedom from economic slavery can begin with one small town. Indeed, one small town has already adopted the Ubuntu Contibutionism philosophy and begun the transition to becoming entirely an Ubuntu Contibutionism community. That town is North Frontenac, located in Ontario, Canada. In the remainder of the book, Michael Tellinger delineates how to use the tools of enslavement as tools of liberation. This is the beginning of the Ubuntu Liberation Movement. The Contributionism philosophy is human-centric. The model is designed for humans to experience prosperity and abundance for all. I encourage you to read the book. It is one of the best books that I’ve read in my life. I was highly impressed by how well researched the book is, the innovation and creative thought employed, by the thoroughness of the development of proposed actions, as well as by the quality of the organization of the material. For Linux users, I want to clarify and disambiguate that the word Ubuntu used in this context is not referring to an operating system. Rather, it is a word which describes a traditional African tradition of teamwork.